Well, the good news is that this issue does read better the second time through. I’ve re-read Flash: Rebirth #1 and #2, then read #3 again. Oddly enough, I liked the first two issues better the first time through than the second, and like this one better the second time through than the first read. The bad news is that the cliffhanger still leaves me cold. Now it could just be relaunch fatigue. The excitement of “Geoff Johns is back! With Ethan Van Sciver!” has worn off by now, and in a sense the actual relaunch isn’t going to be for another four months or more. 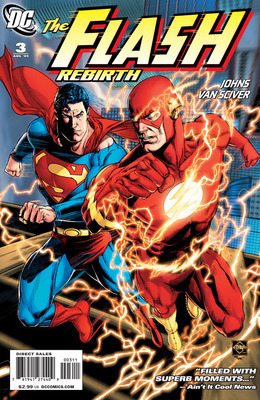 Flash: Rebirth isn’t so much a new direction as it is the process of changing course. It’s not the new house, it’s the act of remodeling. And you know, it would be nice to actually move into that house instead of watch the contractors working on it. But the main purpose of Flash: Rebirth is to convince people that the new direction is worth their time. People are asking, “Why should I get involved with a series that DC has relaunched 3 times in the last 3 years? Why should I let myself get attached to this new direction when they change it every 6 months? Why should I let myself get attached to the main character when they replace him every year?” By going back to Barry Allen, the one character whose resurrection was not an option for more than 20 years, they’re making a commitment: “This time, we really mean it!” In theory, that should clear away the baggage the Flash has accumulated over the last 3 years and leave it on the same level as any other comics launch. Which still leaves hooking the readers on the Flash, and hooking them on Barry Allen. I don’t think I can really go into the rest of the issue without spoilers, so… you’ve been warned! My favorite page was the one where Bart shows up and asks Barry about Max. I don’t know why, but that one just got me. Logically, Bart and Barry have probably met sometime between the end of the Final Crisis books and the beginning of Flash: Rebirth, but this is essentially their first on-panel meeting. I also really liked the sequence in which Barry runs into the speed force. “As long as I remember Iris, I’ll be okay. As long as I remember Iris. As long as I remember…what’s her name?” And on the second read, it really struck me that Johnny Quick and Max Mercury are essentially sacrificing what’s left of their individuality to help Barry maintain his. There were actually a lot of moments and elements that I really liked: Barry’s thoughts on how Wally and Jay have changed since he saw them last. Barry telling Superman, after Superman reminded him that he actually beat him in a few races, “Those were for charity” and then leaving him in the dust. Barry’s determination to save everyone else even at the cost of his own life. Forcing Barry to actually spend some time with Iris (even though it didn’t work). The parallels of Jesse seeing her father this issue and Christina seeing Savitar last time. I also really liked the things Ethan Van Sciver has been doing with the layouts — the tall, vertical columns as Barry drops from the containment cylinder, the full-width horizontal panels giving a strong sense of motion, Superman appearing BAM! onto a full page, the claw-and-skull overlay as Barry is being consumed by the black aura of death. And the book felt fast. Professor Zoom as the mystery villain behind it all. It’s just too obvious and, frankly, too formulaic: bring back a dead hero, then bring back his dead adversary. It’s like doing a Superman story with a mystery villain who turns out to be Lex Luthor. There’s no surprise to it. There’s no impact. I actually would have found it more interesting if they’d gone for Cobalt Blue (possibly with a new codename), because as much as many people hate the character and the concept of an evil twin, I think the concept of Barry’s opposite number does have potential — and Geoff Johns has proven the ability to make any villain interesting. Besides, in terms of archetypes, Professor Zoom, Cobalt Blue and the Black Flash are all the Flash’s conceptual evil twin (or evil counterpart in TVTropes’ terminology). I guess when I think about it that’s my biggest actual complaint. A few other minor bits, like Iris’ bow-tie obsession, or the technobabble explanation of Barry’s predicament that would do Star Trek: The Next Generation proud. It’s not that the rest of the book is bad, it’s just that it isn’t satisfying. It may be that I’m just too close to the subject. Perhaps, like with my Final Crisis Theory of Impenetrability, I know too much about the way the Flash used to be. How Barry’s parents were still around during his career as a super-hero, or other ways that Barry and Iris could have met. Maybe Professor Zoom only seemed obvious because I knew he was Barry’s arch-enemy? For some comparison, my wife read all three issues (so far) of Flash: Rebirth tonight. She’s picked up a lot of “Flash facts” from conversation and from proofreading the occasional post, and has read a few scattered issues plus about half of the William Messner-Loebs run (so way before the speed force or Black Flash was introduced). She found the story intriguing, and in particular noticed a heavy emphasis on mentor/student relationships: Barry and Wally. Jay and Barry. Wally and Bart. Max and Bart. Savitar and Christina. Johnny Quick and Jesse Quick. With the emphasis placed on Max, and the fact that he didn’t disintegrate at the end of this issue, she theorized that they might be setting up a situation where either Barry or Max can survive, but not both — and someone, possibly Bart, will have to choose. So maybe I’m being like the subset of Star Trek fans who can’t watch the J.J. Abrams movie on its own terms. Maybe the reason I can’t get into this version of the Flash is that I keep expecting him to be the Barry Allen whose exploits I read in back-issues, rather than some other Barry Allen who looks the same and knows the same people, but whose personality has been shaped by different life events. All I can say for sure is that this issue didn’t grab me anywhere near as well as the first two did. This entry was posted in Reviews and tagged Barry Allen, Ethan van Sciver, Flash: Rebirth, Geoff Johns, Max Mercury, Star Trek on June 11, 2009 by Kelson. As usual, I totally agree in regards to feelings towards this book. Three issues in, and I’m still not sold on it. Pretty much agreed. Why Zoom? That struck me as way too similar to the Green Lantern Rebirth. Also, enough with the friggin’ bow tie. Eh, maybe it’s just the fact that seeing normal, everyman Barry Allen being all dark and brooding is bothering me. I dunno, I just wish they had used this opportunity to introduce a completely new Flash instead of bringing back Barry. Personally, I’d love to see a Batman and Robin dynamic with Wally and Bart. Maybe the next few issues will convince me otherwise? 1. Assess what is and isn’t working with the current series, focus on what works, commit a high-profile creative team to a new direction and stick with it (rather than changing direction every 6 months). 2. Relaunch again and bet everything on the Hail Mary pass by bringing back Barry Allen. I would have preferred #1, but they went with #2. Actually, I would have preferred that they not screw up the series to start with. But that’s all, as they say, water under the drawbridge. I can’t exactly hop on a cosmic treadmill and go back in time to tell DC not to relaunch after Geoff Johns left the book in 2005, or to handle the relaunch differently. Yeah, I suppose that’s true. I just would’ve preferred anything else to this. I mean, Barry’s back, now Zoom’s back; it just seems to sort of invalidate the past 23 years of Flash comics by bringing these two back, essentially resetting the universe to right before the trial. I mean hell, Wally already defeated Zoom by surpassing Barry and becoming stronger/faster than either of them, so this just seems to be a step back. The Trial of Barry Allen is what got me into comics… those were the very first comics I ever bought (though they were bought all at once at a county fair a few months after the conclusion), so I may be a bit more emotionally attached to the idea that Reverse Flash is dead, and should stay that way. I was sure there was no way that Geoff Johns would stoop to bringing back Prof. Zoom as the big bad. It really is just too obvious. This issue was the best of the run, until the last page. I was a kid again when I read the sequence with Superman, ESPECIALLY the “Those were for charity” bit. It was excellent writing with a nod to the Superman/Flash race issues without leaving the new reader feeling like they missed something. The art is perfect – I LOVED the big speedforce hand wanting to get to Wally while Barry was in the chamber, and the lightning bolt trying to hit Jay. But, Reverse Flash? Really? That’s what he came up with? With a goofy wand as well? The wand makes me wonder if it’s not Abra Kadabra in disguise, though… maybe there’s a twist in there somewhere. I can hope, at least. *sigh* Forgot one point at the end. There’s no real indication that the “magician” mentioned is Kadabra, and even if it is there’s no reason that Kadabra couldn’t have won the confrontation. I feel that if Kadabra went down, Geoff would have wanted to show us that on-screen, rather than the way it was presented in the comic. Hmm…good point. It seems like they would have shown Kadabra himself blasted by an off-panel attacker, like the sequence with the CSI murders in #1. And certainly it would be appropriate to use misdirection in a scene with a magician. The off-panel confrontation is starting to remind me of something, I just can’t place what. Abra Kadabra did pretend to be Prof Zoom during the trial of Barry Allen. I’m sure it’s been done a bunch of times, but I just can’t think of any examples right now. I did ponder the idea of Abra Kadabra actually being the victor but having heavy inclinations as to who the mystery villain was – I just didn’t see him winning that fight. Besides the “offscreen” action another story element that shouldn’t be lost in the mix here is that Barry’s effigy turned black – likely another reference to him becoming Black Flash. But you have to wonder… why is this useful to the story now that we’ve already seen Barry transform? Speaking of lost in the mix – Johnny Quick said that Barry was the answer to the speed formula. This is obviously reminiscent of his encounter with Savitar but how is it Johnny or Savvy know this? It can’t be knowledge rendered by embracing the speedforce since Barry doesn’t know… Answer the question Mr. Quick! How much did you know and when did you know it??? Kelson, Interesting observations by the Mrs.! I sincerely hope there isn’t a choice between Barry and Max, because Max, as we know, is AWESOME. It’s definitely picking up steam though. They finally addressed Barry acting out of character with Iris bringing up his dedication to family and friends. It still doesn’t make sense though since Grant Morrisson had already affirmed that inherent nature of Barry in Final Crisis. Iris should serve as a grounding figure for Barry just as she always did in the silver age but this particular point is a major element of the character and franchise – why would it be the first thing he embraces upon his return and the first thing he forgets in his own comic? At least we got more bowtie storyline. teehee. Absolutely: Barry Allen in Final Crisis was much more recognizable as Barry Allen. I get the impression that Barry’s personality is as much a story point as Bart’s personality was in “Lightning in a Bottle” — something that’s a starting point such that the story will move him to a more recognizable place — but that doesn’t make it any less frustrating to read serialized. It almost makes me wish I’d waited for the hardcover, but that would have made it difficult to keep this site current. As for the bow tie, I think Geoff Johns is picking it out as a symbol of Barry Allen’s civilian ID in the same way that Clark Kent’s glasses are a symbol of his civilian guise. For whatever that’s worth. I was being silly about the bow tie of course – I’m a succer for the references like that as well as anyone. As a literary device I’m not sure it could function the same way Clark’s glasses do since those are intended to signify that the Clark identity is the mask. Iris wouldn’t serve the story well to give him a mask as this would disenfranchise her from the family/legacy theme in Flash. On the other hand it might be an attempt to remind him of those very ideas when he is in his Barry persona. I don’t like that idea as it necessitates them trying to accentuate those conservative, hard cop, rogue hero characteristics in Barry’s personality. Which then wouldn’t make sense because he hasn’t shown any duality in the identities in Rebirth thus far. I think this is where the bowtie works. Before it was just a silly out of place story in issue 2, that didn’t really do anything but explain it’s own existence. But now it has symbolic meaning, it isn’t just because he needed a bowtie for a court case, it was a gift from Iris on their first date, and essentially a symbol of their love. I mean check the dialog there, he thinks it’s a ridiculous gift, but when he realizes what it really means he graciously accepts it from her. Not to mention, it isn’t a Flash ring or anything like that, it’s tied to BARRY and his personal identity, the big thing he’s grappling with as he enters the Speed force. For that alone I thought it was great. I agree the art is amazing, and as I said in a review I wrote elsewhere, the scenes where Barry is running back into the speed force are probably my favorite of that same idea ever drawn. Short of when he drew it in Impulse. I’m not sold or convinced on the Barry/Iris relationship being super strong or important yet, I understand it’s supposed to be, but come on. We read 100+ issues of Wally using Linda as his beacon time and again, and for a while they were all truly epic. Heck, we even saw the “remember her, remember her remember her…. I CAN’T REMEMBER HER NAME” thing in Race Against Time. I probably honestly would have enjoyed it here too, if this book weren’t supposed to be convincing me that Barry Allen is the only person these stories could be about… since they already did parts of this story with other people. As for zoom? well… at least it’s not an energy manifestation speed parasite or something. I actually liked this issue, which was a surprise to me as the first two issues not impressive at all. This one actually seemed to have a bit of direction, and it was finally nice to see Barry meet Bart. Last page was neat, but I agree that the “wand” is silly. Having Reverse-Flash back isn’t a big deal to me as I figured he would be the main villain before the series even began (Hal has Sinestro, Batman has Joker, Superman has Luthor, etc.). Nice to see Max again. And yes, I’m sick of the bow tie, which was the low point of this issue for me. I would still rather see Wally as the star of the book as I just don’t care that much about Barry, but at least the story is stepping up the pace. I’m doubt Reverse Flash is the MAIN/FINAL/ONLY villain … remember one of the coolest scenes in Green Lantern in recent memory was when Sinestro, Cyborg, Superboy Prime were all revealed … and then the freakin’ Anti-Monitor? what a nice thing happen with flash…..